A Poulsbo-based production company run by Kelvin Hughes took some aerial shots of the Viking Fest Parade and road race that happened last weekend. Things get pretty intimate around 2:20. Check out the parade video below. A local woman, who goes by the name LauraInk on the Reddit site, wrote on her “beer after tea” blog about the dinning experience where she and her husband, along with their three children (ages 2, 3 and 8), received a “well-behaved child” discount. It sounds like this is the first time the restaurant has offered the $4 discount for well-behaved “mini diners”. “We were seated at one of the last available tables around 6pm and were greeted happily with menus and bread. We sat and discussed planets, racecars, zebra jokes and “Freckle Juice” until we ate our pizzas, pasta and aforementioned ragu. The food was lovely, our oldest, who is clearly in a growth spurt, ate her share and mine, and our littles munched happily while periodically stopping to notice the small fireplace in the corner and the window paintings on the wall of grapevines in Italy. Near the end of our meal, our server visits our table to tell us how impressed the staff was with our kids’ behavior and that many of them didn’t even realize we had little ones eating with us. She then brought us a bowl of ice cream to share. When we received our tab, it had a discount listed for “Well Behaved Kids”. A pleasant surprise after a lovely meal. We, as parents, lead by example and if we have to spell out what and how we’re doing something, we will. We don’t expect handouts for acting respectful of the folks who bring us our food. But it certainly makes you feel good when someone else notices your kids in a positive light. It’s interesting to read some of the comments from other people who have heard this story — note the link to the Reddit and Babble sites offer more adult language than wet use here — the responses are mixed on whether a family should get a discount because their kids behave well, or as some argue “the way they should”, when they’re in public. Regardless of where you stand on the decision to give the discount, the bottom line is a local family of five was the recipient of an unexpected act of kindness from a local business. That’s something that should make you smile. Bruce Bryant of Poulsbo has set up a webcam overlooking Poulsbo from somewhere high in the hills near Raab Park. I, for one, will be checking it a lot today. The sun is shining brightly in Bremerton right now (3:24 p.m., Saturday). I just returned from Silverdale, where it was also a sunny, sunny day. 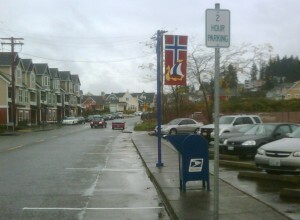 The picture in Poulsbo, though, is a little gray. And they were snowed on earlier. Feel free to let us know if you see snow at your house, or anywhere you’re traveling. Of course I’m most interested in Kitsap weather, but if you’re in Iowa or something I wouldn’t stop you from chiming in. Come for the lutefisk, stay and write a letter to the editor about it. Colleen Smidt, frequent blog visitor and columnist over at the other guys, sent me a photo that speaks to the slow pace in Poulsbo. It’s not just the stop signs, the city is now inviting you to write a letter, put it in an envelope, stick a stamp on the letter and drop it in the mailbox all in one sitting. Still a check sender? Pay your bills in one sitting. 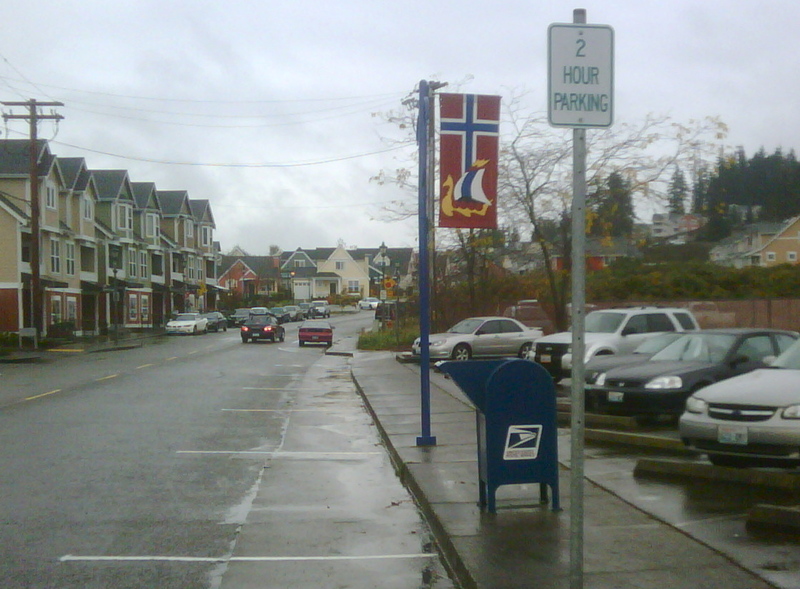 For years people have gripped at the fact that a drive up street side mail drop was on the wrong side of the street to begin with. Unless you have a passenger with you it is impossible to drive-up and deposit the mail without getting out of your car. But at least you could avoid driving through the entire parking lot to use the other ill placed drive up box. And now to add insult to injury the city has marked parking spaces in front of this poorly placed drive up mail drop and installed a “2 hour parking” sign on top of it. Absolutely brilliant! Way to improve efficiency and traffic flow through one of the busiest places in town! Somebody working for the city has been eating too much lutefisk. The unusual part in all this, from my perspective, is that there is still a mailbox near a street. I thought those went away with vinyl records and Ralph Nader. The last one I remember seeing was in an episode of The Simpsons, and I lived less than a quarter mile from this very post office for three years. My guess is there was a bet made somewhere in city offices to see if anyone would notice. Someone lost that bet.